Last year I started a new tradition thanks to my pal, Val, who blogs at Corn Beans Pigs and Kids. Val and I have a lot in common and we first met as part of the North Iowa Bloggers group. I have a huge respect for Val and for her outlook on life. She has been a role model to me in so many ways. Last year she shared that she was going to leave some goodies out for all of the delivery people who stop at their farm. USPS, UPS, Fed Ex and other package deliverers are some of the hardest working people this time of year especially. I know that we keep ours in shape with all of our online orders . They navigate our driveway with grace and don’t complain and so this year again I am thanking them with a basket of goodies and a cooler of drinks that they can help themselves to whenever they make the trip down the driveway. So this year when they find their way down the driveway they can help themselves to some sweets and treats and drinks to help fuel them on their merry way. It’s a really simple thing but one that they remember. I overheard one UPS guy who was training a new driver say “Hey-this is a really nice lady . She leaves us goodies and drinks to take and always gives us cookies at Christmas.” I guess the word gets out. Do you do anything for the delivery folks in your life? I would love to hear what creative ways others have to show their appreciation. Tell me all about it in the comments and remember that each comment means a 50 cent donation to our Comments for a Cause – Todd H. Bol Vision Fund. What a nice idea!!! You are so very thoughtful, and it’s nice that you overheard the UPS driver complimenting you! I love this and might copy this idea! I love your heart and thoughtfulness! And thank you for the birthday card!!! Beth- delightful idea! You’re the snack lady! One of our neighbor boys worked as a UPS “runner” during the holiday season while he was in college. He rode shotgun in the truck and then ran through the snow up driveways to deliver the boxes. His stories made me appreciate my delivery “guys” so much more. IT’s wicked cool you do this… Happy holidaze, Beth! Beth that is such a GREAT idea. I may have to follow suit this year. This ya a very good tradition to begin. I’m in. Isn’t it a great idea? You don’t have to do much–I put fruit out as well so and try to have some healthy options in the basket as well. Hope you are able to do something similar for your folks! I remember when you did this last year and it’s such a thoughtful gesture, confirmed by that overheard comment. Since I rarely order online (once a year if that), I seldom have delivery people at my door. 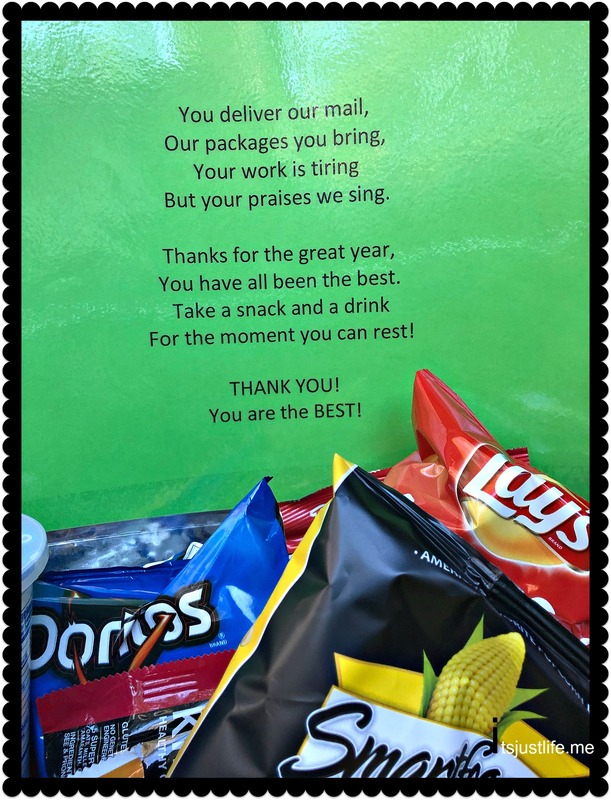 I don’t know what I would do without my delivery folks – we really do rely on them a lot and it is fun to be able to pay them back with a snack and a drink. Very simple but they appreciate it. Such a wonderful idea and something I should seriously set up now that our holiday ordering will ramp up. I recall you did this last year and I thought it was a great idea! The best delivery person we ever had was our mail carrier when we lived on an Army post. He was the nicest man, so kind and caring. We gave him treats at Christmas time and he always appreciated it. There are some really great delivery folks out there and we have had some of the best over the years. I always give them cookies and snack bags at Christmas and I think I should do it more often. Something to strive for.